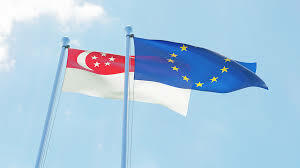 On February 13, the European Parliament approved the European Union-Singapore Free Trade Agreement (EUSFTA). The comprehensive trade agreement will enter into force as soon as Singapore concludes its own internal procedures and both parties complete the final formalities. This post examines the extent to which the procurement covered under the bilateral agreement exceeds the parties’ commitments under the WTO Government Procurement Agreement (GPA). The Government Procurement chapter in the EUSFTA follows the rules on transparency and non-discrimination in the GPA but includes some provisions that go beyond the plurilateral agreement, including on modifications of coverage as a consequence of privatizing covered entities. With regard to the procurement covered under the EUSFTA, the parties have exceeded their GPA commitments in four areas: central government coverage; utilities and other entities; public-private partnerships; and services. Under their bilateral agreement, the EU and Singapore expand upon their GPA coverage of central government entities in different ways. The EU gives Singapore access to nearly 200 central government entities of EU member states that it withholds under the GPA. For its part, Singapore significantly reduces the threshold for the procurement of goods and services by its central government entities from its GPA threshold of 130,000 Special Drawing Rights (SDRs) to 50,000 SDRs. The second area of expansion involves the coverage of utilities and other entities. In the EUSFTA, Singapore has more than doubled its coverage, listing 57 entities, in contrast to its GPA coverage of 23 entities. Under the GPA, the EU withholds procurement by procuring entities operating in the railways sector until Singapore provides “satisfactory reciprocal access to EU goods, suppliers, services and service providers”. The EU has removed this restriction in the EUSFTA. Coverage of public-private partnerships (PPPs) represents the third area of expanded procurement commitments. The Government Procurement chapter applies to PPPs, which include various contractual arrangements such as build-operate-transfer contracts. Under the GPA, Singapore has no commitments relating to PPPs. The EU does, but limits access to them: it opens works concessions to just six GPA parties, not including Singapore. Under the FTA, the EU provides Singapore with access to its works concessions, subject to the same limitations as in the GPA: it only applies to concession contracts awarded by central and sub-central government entities under a national treatment regime. They are not subject to the procurement procedures in the agreement. Instead, the entities must only ensure transparency in the award of works concessions contracts and the availability of an effective review procedure that enable a supplier to challenge decisions relating to the award of such contracts. In the bilateral agreement, Singapore added a number of service categories that it does not include in its GPA commitments, including computer services and a number of telecommunications services. That coverage will open up access to EU services covered under the GPA only on a reciprocal basis. The Singapore government has highlighted benefits to its firms of access to a number of EU services, including computer-related services, telecommunications services, land transport services, maintenance and repair services, sewage and refuse disposal, and architecture and engineering services. The EU-Singapore agreement is the third trade agreement negotiated recently by the EU that expand on GPA commitments. The EU-Canada agreement, implemented in October 2017, incorporated new coverage, especially with respect to sub-central and other entities. Similarly, the EU-Japan agreement, which entered into force at the beginning of February, included expanded commitments, in particular in the railways sector and sub-central coverage. The EUSFTA was initially concluded in 2014 but delayed after the European Commission asked the European Court of Justice (ECJ) to resolve a dispute relating to the division of powers between the EU and the member states. In 2017, the ECJ ruled that the EU has exclusive authority to conclude trade pacts, except for provisions relating to investment over which member states retain authority. As a consequence, the EU and Singapore restructured their agreement to form a trade agreement and an investment protection agreement, with separate ratification tracks. For the EU, the trade agreement only needs the approval of the Council of the European Union and the European Parliament. However, the investment protection agreement must be ratified by the national and several regional parliaments in the member states before it can enter into force.